According to Buddhist tradition, the disciple Devadatta was the Buddha's cousin and also brother to the Buddha's wife, Yasodhara. Devadatta is said to have caused a split in the sangha by persuading 500 monks to leave the Buddha and follow him instead. This story of Devadatta is preserved in the Pali Tipitika. In this story, Devadatta entered the order of Buddhist monks at the same time as Ananda and other noble youths of the Shakya clan, the clan of the historical Buddha. Devadatta applied himself to practice. But he became frustrated when he failed to progress toward becoming an Arhat. So, instead, he applied his practice toward developing supernatural power instead of the realization of enlightenment. It was said he also became driven by jealousy of his kinsman, the Buddha. Devadatta believed he should be the World-Honored One and the leader of the order of monks. One day he approached the Buddha and pointed out that the Buddha was growing older. He proposed that he be put in charge of the order to relieve the Buddha of the burden. The Buddha rebuked Devadatta harshly and said he was not worthy. Thus Devadatta became the Buddha's enemy. Later, the Buddha was questioned how his harsh response to Devadatta was justified as Right Speech. I'll come back to this a bit later. Devadatta had gained the favor of Prince Ajatasattu of Magadha. Ajatasattu's father, King Bimbisara, was a devoted patron of the Buddha. Devadatta persuaded the prince to murder his father and assume the throne of Magadha. At the same time, Devadatta vowed to have the Buddha murdered so he could take over the sangha. So that the deed could not be traced back to Devadatta, the plan was to send a second group of "hit men" to assassinate the first one, and then the third group to take out the second one, and so on for some time. But when the would-be assassins approached the Buddha they couldn't carry out the order. Then Devadatta tried to do the job himself, by dropping a rock on the Buddha. The rock bounced off the mountainside and broke into pieces. The next attempt involved a large bull elephant in a drug-induced fury, but the elephant was gentled in the Buddha's presence. Monks must live all their lives in the forest. Monks must live only on alms obtained by begging, and should not accept invitations to dine with others. Monks must wear robes made only from rags collected from rubbish heaps and cremation grounds. They must not accept donations of cloth at any time. Monks must sleep at the foot of trees and not under a roof. Monks must refrain from eating fish or meat throughout their lives. The Buddha responded as Devadatta had predicted he would. He said that monks could follow the first four austerities if they wished, but he refused to make them mandatory. And he rejected the fifth austerity entirely. Devadatta persuaded 500 monks that his Super Austerity Plan was a surer path to enlightenment than the Buddha's, and they followed Devadatta to become his disciples. In response, the Buddha sent two of his disciples, Sariputra and Mahamaudgayalyana, to teach the dharma to the wayward monks. Upon hearing the dharma explained correctly, the 500 monks returned to the Buddha. Devadatta was now a sorry and broken man, and he soon fell mortally ill. On his deathbed, he repented of his misdeeds and wished to see the Buddha one more time, but Devadatta died before his liter-bearers could reach him. The lives of the Buddha and his disciples were preserved in several oral recitation traditions before they were written down. 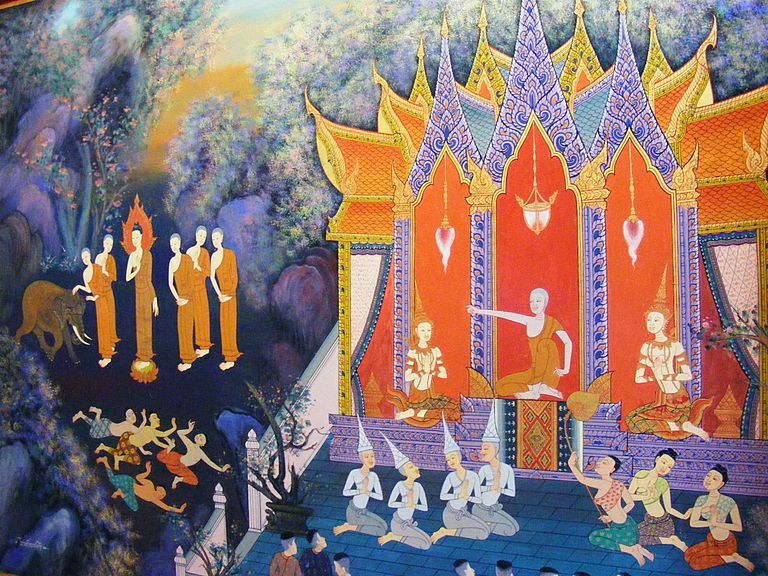 The Pali tradition, which is the foundation of Theravada Buddhism, is the best known. Another oral tradition was preserved by the Mahasanghika sect, which was formed about 320 BCE. Mahasanghika is an important forerunner of Mahayana. Mahasanghika remembered Devadatta as a devout and saintly monk. No trace of the "evil Devadatta" story can be found in their version of the canon. This has led some scholars to speculate that the story of the renegade Devadatta is a later invention. If we assume the Pali version of Devadatta's story is the more accurate one, however, we can find an interesting footnote in the Abhava Sutta of the Pali Tipitika (Majjhima Nikaya 58). In brief, the Buddha was questioned about the harsh words he said to Devadatta that caused him to turn against the Buddha. The Buddha justified his criticisms of Devadatta by comparing him to a small child who had taken a pebble into his mouth and was about to swallow it. Adults would naturally do whatever it took to get the pebble out of the child. Even if extracting the pebble drew blood, it must be done. The moral appears to be that it is better to hurt someone's feelings than to let them dwell in deceitfulness.